A Clafoutis is a french dessert, which is made with a pancake like batter poured over cherries and then baked in the oven. Cherries are the traditional choice of fruit, but it can be made with a wide variety of fruits like for example plums, apricots, peaches, apples or raspberries. 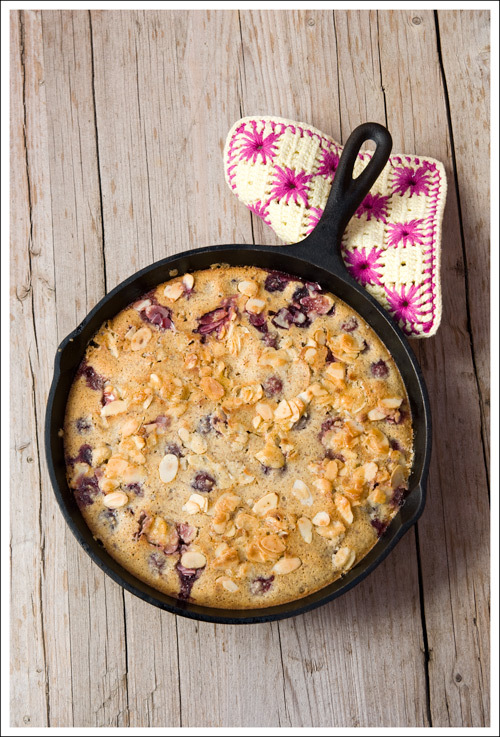 This batter is made with ground almonds, which pairs very well with the cherries. 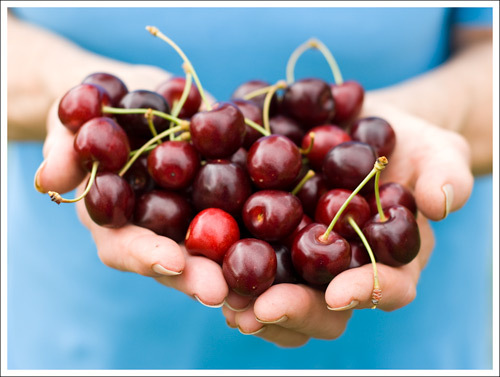 Some recipes use cherries with their pits, or leave a few pits in, since the pits will also release an almond flavor. We have beautiful cherries in our garden right now, both sweet and sour ones. Usually I use sour cherries for baking and jam making and sweet ones are just eaten off the tree. But this year there are so many, that I also tried a few dishes with them. I have to say they are equally good for baking, you just need to use less sugar. I am also happy to announce that I have won first place at this month' DMBLGIT contest with my picture of the burger-style macarons. Thanks to Charline from Charline cuisine for hosting this month event and congratulations to my fellow winners. Check out the beautiful entries on Charlines blog. Pit the cherries. Melt 10 g of the butter in your skillet. Add 40 g of sugar and put the pitted cherries on top. In a small pot brown 80 g of the butter over medium heat. In a bowl mix together the flour, 100 g of the sugar, ground almonds, salt and vanilla together. In a separate bowl use a handheld mixer to beat the eggs together with the milk while slowly adding the browned butter. Mix everything together with the flour mixture and pour over the cherries. Melt the remaining 70 g of the butter in a small pot over medium heat. Add the remaining 40 g of the sugar and the sliced almonds and mix until well combined. Spread on top of the clafoutis and bake for about 25-30 minutes. Serve lukewarm with freshly whipped cream or some vanilla ice-cream.